This Kopra dried coconut chutney recipe is commonly made in Maharashtra, North Karnataka. As it is a dry chutney, it has a long shelf life. Dry coconut is referred to as khobre - kopra - copra so this dried coconut chutney is called khobryachi chutney(marathi), khobbari chutney(kannada). Look at the instructions and you will see how easy it is to make this dry kopra chutney powder. This dry chutney powder goes very well with rotis such as jowar or bajra bhakri and chapati. 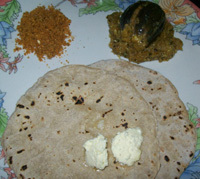 The image shows copra chutney with jowar bhakri, fresh butter and stuffed brinjal(eggplant) curry. Dry coconut lasts long, so does this chutney. By roasting the grated kopra lightly, the chutney powder has longer shelf life. You may use desiccated coconut readily available in the market instead of dried coconut. There is no need to roast desiccated coconut. This chutney can be made with or without garlic. The color of the chutney will depend on the variety, color and quality of the red chilies you use. It will also depend on the roasting of the coconut. 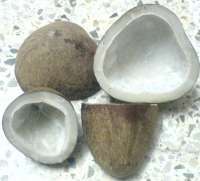 I prefer to grind the copra chutney a little coarse as you can see in the image below. 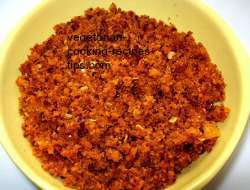 Heat a fry pan and add the grated coconut. Lightly roast the grated coconut on low flame for a few minutes till it is light brown. Roasting enhances the taste and flavor and also preserves the chutney for a long time. If you sure to finish the chutney within 8-10 days you may omit roasting. Grind together the coconut and the other ingredients to a coarse powder. Serve with bhakri, chapati. You may also use it to sprinkle on buttered toast, sandwiches, poori, paratha etc. It can also be added to vegetable curries to add to taste. You may slice the copra thinly instead of grating. Any way you will be grinding or pounding it. You may use whole dry red chilies instead of red chili powder. Roast the dry red chilies with a few drops of oil till they are crisp. Cool and then grind with the roasted coconut. I find using red chili powder easier. Do not grind the chutney too fine. A little coarse powder is better. Traditionally, this chutney was pounded using a mortar and pestle and the chutney tastes great. Use mortar and pestle if you have available at home and if you have the time and energy. The enhanced taste is definitely worth the trouble. Jaggery / gud is used to balance the sourness of tamarind. You may use it or omit it depending on your liking of sweetness or sourness.